Diane von Furstenberg and her eponymous fashion brand have long been symbols of confidence, grace and fearlessness. Now, as Diane mentors a new generation of hard-working young women ready to take their careers to the next level at DVF, E! is there to capture every triumphant and pressure-filled moment in a new genre of television. Only the most intelligent and talented young women are considered for the glamorous and highly coveted brand ambassador position with one of fashion’s most prestigious brands. 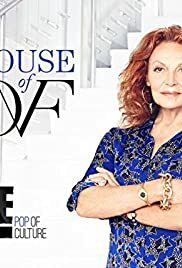 Diane herself has handpicked the eight young women, who are determined to impress her as they are tasked with working in different areas of Diane’s empire, based in the dazzling DVF offices in Manhattan’s Meatpacking District. From planning a press lunch to working at the DVF Spring 2015 show during Fashion Week, the candidates are expected to execute every duty perfectly, although things don’t always go as planned. Baking competition pitting teams of professional chefs against each other to create towering showpieces and multitudes of miniatures, under the scrutiny of two of the industry’s top patissiers. Centers around comedian Rob Schneider’s real life while living in Hollywood.